Sometimes the very early stages of modeling can reveal important lessons. Validation and data are important for building a policy-relevant model, but setting up the basic physics of a problem and exploring its dynamics are important building blocks. From this process, we have learned some interesting lessons about agriculture and soil carbon sequestration. As part of our partnership with Mohammed VI Polytechnic University (UM6P), we are continuing to develop our Climate and Agriculture Policy Simulator. We have learned important lessons about building a sustainable food system, but are adding further capabilities to the model to make it more useful. One such capability is a deeper understanding of soil carbon. As part of our modeling process, we’ve built simple submodels to test and understand their behavior before adding them to the main model. The soil carbon and biomass submodel looks at deforestation, afforestation, and changes to the carbon content of managed soils. It contains several simplifying assumptions. For one, only two categories of land use are modeled – forest and farmland. Also, the carbon content of soils and biomass is treated as having the same dynamics, and do not depend on the rest of the carbon cycle. The complete system is more complex than this model, but we are still able to capture important dynamics. For example, we have captured that forests have much higher carbon content than farmland, and that farms using conservation techniques contain more carbon than those using conventional practice. Farmers can adopt or abandon conservation techniques, and it takes time for their practices to change. It also takes time for carbon to build up or decay. Deforestation and afforestation change the land usage between forest and farmland at an adjustable percentage per year. When the land changes use, some of its carbon is lost to the atmosphere through burning and decay, and some of it stays in the soil. With these elements we can explore emissions and sequestration in response to various changes. First, let us look at changes to one farming practice, the no-till technique. We assume that this technique could increase carbon in farm soils by a factor of 5. However, the time needed to diffuse the no-till practice and build up the soil creates lags. The graphs below show the percent of no-till adoption by farmers in red and soil carbon concentration in blue, over time. On the left, half of all farms adopt the practice over 5 years, and it takes 5 years for carbon to reach its equilibrium value. On the right, each of these processes takes 20 years. As you can see, we should expect no-till farming to take a long time to get results under any realistic assumptions. The amount of carbon sequestered in these two scenarios is the same – and it is a discrete, limited amount. There is a certain amount of land that has a certain change in carbon per hectare. The only difference is shown in the graph below: whether the flow rate of CO2 into the soils is a high peak of short duration or a lower and longer one. These scenarios assume that once farmers adopt the no-till practice, they never give it up and the carbon stays locked in the soils forever. If this isn’t true, eventually more carbon will escape than is being sequestered – even if farmers maintain the practice for a long time. The graphs below show the potential carbon emissions versus sequestration if farmers adopt the no-till practice rapidly but only keep it for 50 years. One might think that the sequestration would be good for 50 years, but the graph below shows there are net emissions after about 15 years. New farmers would have to be found to adopt no-till if the gains are to be maintained. Next we can look at soil carbon conditions under deforestation. If there is a constant percentage of forest being converted to farmland every year, the carbon content of farmland is higher than it otherwise would be, because the newly deforested farmland raises the average carbon content of farmland. The carbon content then declines for two reasons – there is less forest becoming farm and more farmland over which to average the gains. There are also very high emissions from deforestation and also some emissions from soils as the new farmland is degraded. We can explore combinations of events as well. Below are the graphs for a scenario in which deforestation is completely halted, and then the diffusion of no-till practice starts 5 years later. Farmland soil carbon is much higher using no-till than the amount gained from converting forest, but the total amount sequestered that way is small compared to all that is lost through deforestation. 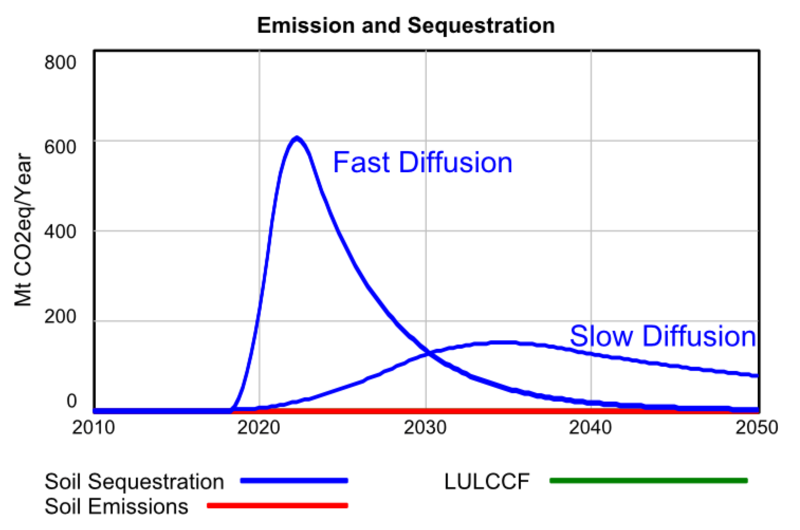 Sequestration takes time, both for the diffusion of innovative new farming techniques (human system time) and also the movement of carbon into the soil (natural system time). Sequestration is finite. There is a carrying capacity for carbon in soils, forests, and anywhere else. We should not expect a constant and continuous rate of indefinite sequestration. These results will hold for any negative emissions technology. A similar structure of equations with different details will have the same overall behavior, with different capacities and time scales. At Climate Interactive we often use the analogy of carbon in the atmosphere being like water in a bathtub, where the inflow is emissions from fossil fuels instead of water. By extension, then, negative emission technologies are not so much creating a bigger drain to get rid of the water, but rather filling buckets from the tub and then balancing them on the rim. You can lower the water level in the tub that way – though you better hope the buckets don’t tip over – but the real solution has to include turning off the tap. For questions about this and our other Climate and Agriculture work, contact Travis Franck.